Athletics is part of the PE syllabus and the college likes every student to find their niche at one or more athletic events. 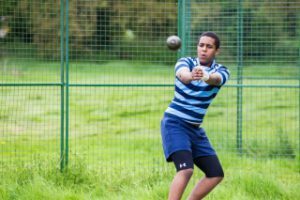 Students can choose from sprints, relays, long-distance, hurdles, high jump, long jump, triple jump, javelin, shot-put, hammer, discus, pole vault and walking. In the summer term athletics comes into its own with West Leinster, Leinster and All-Ireland finals held in Tullamore.